So it must be that the problem only affects inheritFrom used for dind configurations. It seems that relies on the template name directly and not through the label. This means we don't need to change quickstarts as they match to a build pod by label. But we do need to change all the other projects that build docker images (and change all of them at once) and also change the pod template in the jx admin console. Now the commits (all changes to Jenkinsfiles) are also cherry-picked to the 7.0.x branches. We're seeing builds get stuck waiting for agents on the examples cluster. Had to put the pod template back to maven-java11 in order to get the builds running. So this seems to need a bit more work. 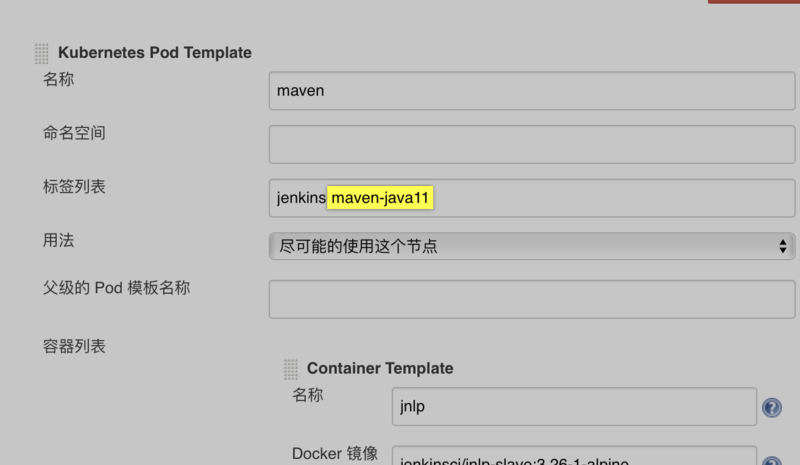 It seems the maven template is applied correctly to master branch but PRs still look for maven-java11, even though that isn't in the Jenkinsfile (not for master or the branch). I suspect upgrading the cluster would resolve this but that would take a while so for now what I'm doing is simply duplicating the whole kubernetes build pod template. This allows the builds to all run correctly. @ryandawsonuk Thank you for your had work. There are much much more problems setting up Jenkin X, anyway Private Jenkins X with Activiti Cloud cluster can be setuped. 1. Jenkins X's docker images are very huge and updated frequently, it made the k8s cluster running in high IO situation( my k8s cluster only has two machines using VMWARE, one machine without SSD ). 3. If published onto the production env, The cluster may consume a lot of CPUs, SSD, you should consider cost. 4. Jenkins X only work fine with github. ( There are too many bugs with gitlab or gitea ) It is not friendly to some business companies. So I had to fall back to use activiti7 core + springboot + spring security to build my production applications. 5. VPN should be setup carefully if you are behind Firewalls（such as GFW）. If you use VPN globally pulling images will be very very slowly. 6. docker mirror should be configed on every node to speed up your installation. @ouyangshixiong thanks a lot for your feedback. Some of this would be very valuable for the JenkinsX project. I believe that they have built something that is pluggable, so most of the issues you mention can be fixed (custom docker registry, other git providers, etc). We are currently working hard to improve the modeler experience, at this stage is early access, so feedback is more than welcome. @ouyangshixiong feel free to get in touch and share what you use case is if you want to join the community and help other people with common problems on kubernetes will be highly appreciated.